I have chatted with folks in my neighborhood, Mount Pleasant, for half a year about supporting the community wireless network I’m organizing here. The most common question they ask first is about “security” in an open network. It usually sounds just like this: “But is it secure?” And, painfully, they frequently interchange “open” and “secure” as regular as “work” for “job,” referring to a wireless network without passwords on the access points. Recently, I thought about the values inherent in Commotion, an open source community wireless firmware project OTI is working on. Commotion will have built-in anonymization and security features. For all the importance of being secure from the start – security having new implications in the digital, networked world – the real potential of the network, the value growth, has to come from an intentional sharing and cooperation. Technical thinking about privacy though has got us in a general mood of securing against others, rather than actively reaching out. I suspect that this is the intent of ISPs, scaring everyone into locking down their wireless APs so no one will share their connection and everyone will have to buy their own Internet access. Plus some leftover hyper-individualistic attitudes from the Cold War. This brings a new face to a problem of balance. I think that one part of the balance we seek when communicating – and one of the values that Commotion should stand for – is “safety.” Safety is a human term that’s understandable in its way to everyone, and yet we are likely to define it in different ways. For the whole communications network – infrastructure, software, the people involved – I think that “safety” is at the nexus of privacy, security, and awareness. “Privacy” is keeping what you want to yourself – “to reveal yourself selectively,” to crib from Wikipedia. You have the right to “not be surprised” as Ashkan puts it. Your sense of others’ knowledge about your assets, information or affairs matters to your decisions and your well-being. Someone could sneak up to your window, or read information you send over a network, without you ever knowing – and without affecting the integrity of the information or your behavior. “Awareness,” the state of knowing what is going on in your environment and being reasonably confident of the consequences of your actions. Most people walk down the street reasonably confident they won’t be robbed, molested or attacked. If the odds were high enough you would be hurt, far fewer people would leave their houses and our society would suffer from the lack of voluntary connections. Security and privacy are great, but if people don’t understand what they mean, what is and is not protected, and what the likely consequences of their actions are on a network, then they are not going to be gregarious online. They will be recluses – society suffers again. Bring these together and you have “safety,” something which I think all people can understand as a human right. Maslow’s hierarchy has it, we understand it to be a key human need on many levels, from freedom from violence to food security to knowing where tomorrow’s paycheck will come from. Technology needs to be built upon human needs, and so resolving those tensions – privacy versus sharing, security versus ease of use, awareness versus the vastness and complexity of networked communications technology – is paramount to developing a just, effective and enjoyable communications infrastructure. This was originally posted at the Open Technology Initiative website. If you are not yet familiar with Mount Pleasant, here’s a chance to learn about one of DC’s most vibrant neighborhoods. It’s a diverse area not far from downtown DC, featuring a main street lined with locally-owned businesses. Many of these shops and restaurants are owned and run by the area’s large Latino community, which has long been central to shaping the neighborhood’s character. However, over the past decade rising housing prices have pushed many in the Latino community east towards Georgia Avenue. In May, I moved to Mount Pleasant and started to learn about the area. In order to encourage community-building and local empowerment and to increase local information-sharing and opportunities for civic engagement, I decided to use skills and ideas garnered from my work at the Open Technology Initiative to organize a community wireless network. Despite my excitement to get started, I didn’t want to rush in without first connecting with the people, the histories, networks, skill sets, and local knowledge already present in the community. My first step was technical: with the help of my OTI colleagues, I specified the hardware for the network and prepared the technology for installation. The first-stage plan was to install a few “nodes” (wireless access points) in order to establish the form and structure of the mesh network – open, interoperable, unfiltered, and decentralized. Then, at the Mount Pleasant Farmers Market, I handed out fliers directing people to an online survey gauging their interest in organizing a community wireless network in the neighborhood. I also posted a few of the fliers in local businesses on Mount Pleasant Street. But I needed to go deeper in order to really connect with the existing social networks of people and projects. Several of my neighbors suggested that I meet Anya Schoolman, a community leader who organized the Mount Pleasant Solar Co-Op. Anya and her son Walter have worked on the co-op for several years, and through this process they have helped residents install solar panels on the roofs of over 100 homes in the neighborhood, which enables them to share solar-generated electricity with the rest of the community. Anya generously offered to host a gathering at her house in July, which we promoted through the listservs she created for the co-op. Thanks to her work in the community, Anya and her home enjoy “community anchor institution” status as a hub of activity in Mount Pleasant. Neighbors know and trust her, and since she provided an introduction to my invitation email on neighborhood listservs, recipients understood the context of participatory community building and neighborhood improvement. About ten people came to the house gathering. We discussed the potential of the network and how to get it running, and five people (myself included) committed to becoming neighbor-links by installing a mesh router on top of our roofs – a process people were already familiar with due to their association with the solar co-op. Thus far we’ve installed two nodes and are planning to install at least three more in the coming months – and new folks have come forward who want to add to the network as well. As we move forward, our plan is to focus on working with underserved groups in Mount Pleasant — people who may not be able to afford monthly contracts, or who are looking for tools to organize to address the effects of displacement of longtime residents due to rising housing costs. We hope to provide a framework that allows the diverse neighborhood to organize together in order to address the trends that affect everyone’s quality of life. We got a room at the Chini Bagh, which used to be the British Consulate in Kashgar during the “Great Game” of the 19th Century. 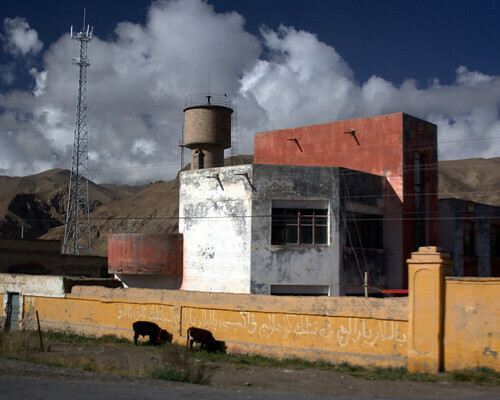 I thought we would go to Tashkurgan the following day, but we decided to stay in Kashgar to arrange better transportation opportunities and secure passage to Urumqi. I gave my dirty clothes to be laundered, and it turned out to be 84 kuai – about five times higher than I ever paid to launder clothes at hotels in China. 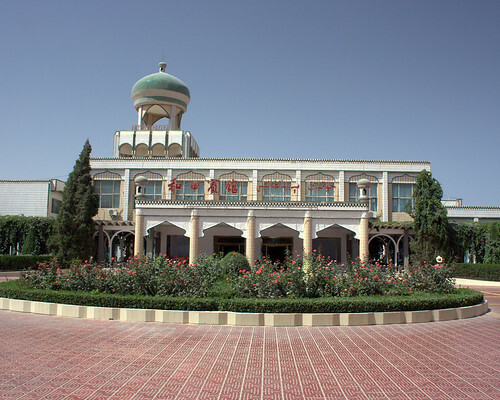 Furthermore, the Chini Bagh’s service was generally awful, despite its reputation as one of the more famous hotels in Kashgar. After eating at a local place, I used the Internet for an hour – had to stay fresh on the job search. The next morning we secured the room for another night before embarking on some haphazard sightseeing. Per the Lonely Planet’s one-size-fits-all recommendations, we taxied to a nice mausoleum, the Abakh Hoja Maziri, and a livestock market with no livestock. I also came down with a sore throat due to the inefficient, overpowered air conditioner in the hotel room. It didn’t help that I drank a couple of delicious Sinkiang Dark beers in the cafe of the hotel, thus lulling my immune system into a relaxed state. 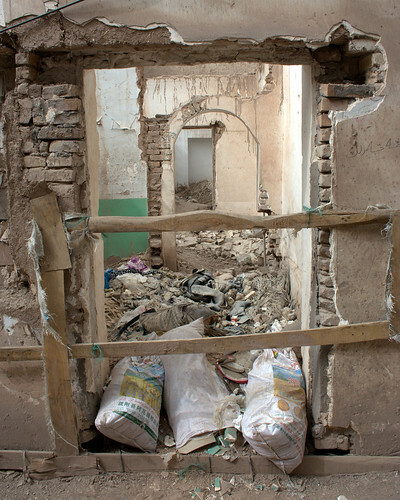 In the afternoon we strolled around the half-rubble old town. Historically (i.e. 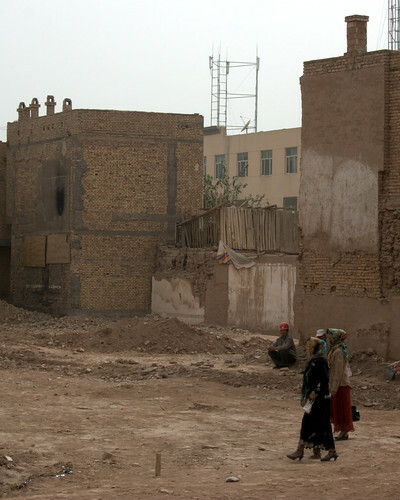 until about 2008) Kashgar’s Old Town was the largest intact authentic Silk Road town, dating from the days when it served as a vibrant hub for the many cultures that passed through its streets bearing all the goods one could want in Eurasia. The extent to which it has been destroyed is painful to witness, and I think that it is exemplary of cultural-related development in modern China: demolish the real McCoy and put up a fake version of it. 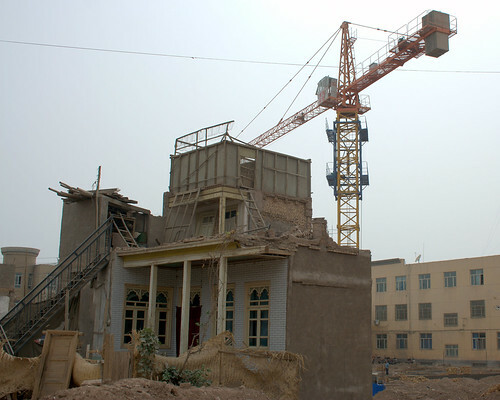 The story unfolding in Kashgar’s old town ties together many of the themes of China’s “growing pains:” transition from old infrastructure to new, forced displacement of residents from traditional community spaces into new high-rise apartments, an overriding focus on municipal district-level quarterly GDP growth, the bizarre preference of Chinese tourists for “Disneyland” culture to authentic artifacts and places, and the central government’s efforts to exert control over restive minorities by undermining their shared cultural heritage. 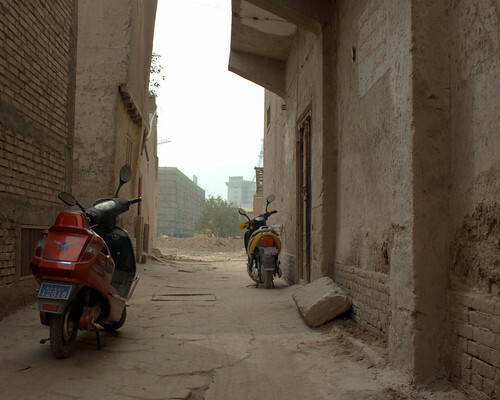 Note that the images below are not unique to Kashgar; different versions of these scenes are found all over China. What Happened to the Neighbors Out Back? Since Kashgar was underwhelming, covered in nasty dust and we had a few days to kill before Eid ul-Fitr, we sought out transport to the Khunjerab Pass, the highest motorable border pass in the world at 4,693 meters – nearly as high as that low-oxygen, high-star count night at Nam Tso in Tibet. We first sought the services of the folks at CITS, which has an office right next to the Chini Bagh. 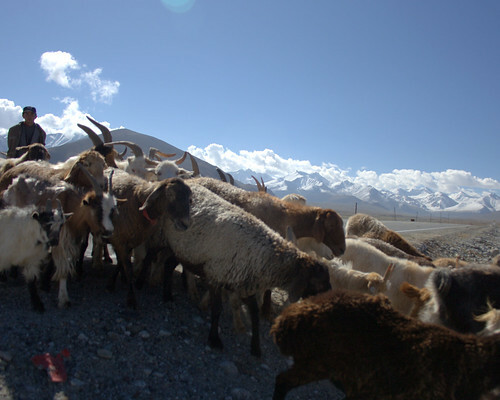 Their price to see both Karakul Lake and the Pass was 1,700 RMB for the both of us – pretty expensive. He called the border office in Tashkurgan to ask about foreigners getting to the border, and the officer told him that foreigners without a forward visa (to Pakistan) could not go up to the Pass. This disappointed us, but we still wanted to get up into the scenic highlands of Tashkurgan. The fellow who runs the cafe at the Chini Bagh offered to do the trip for only 1,000 RMB. We sealed the deal, albeit without the Pass as a part of the package, and proceeded to eat WAY too much da pan ji and tasty yogurt at some place that night. 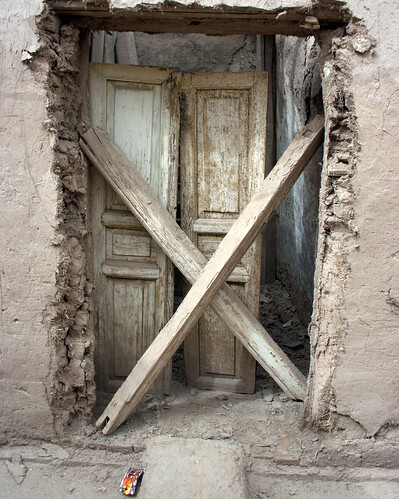 We awoke the next morning to leave for Tashkurgan at ten on the Karakoram Highway. The driver pulled over to allow us to buy hot naan bread on the way, surprisingly tasty for breakfast. We passed Karakol Lake about three hours into the journey; it is beautiful, but the weather was too cloudy for it to be really majestic. After that, I fell asleep until at some point we had to get out of the taxi and present our passports at a police checkpoint. In this part of Xinjiang, they also have the silly registration-checkpoint speed limit that Tibet has. The road was badly washed out in some spots on the Highway. 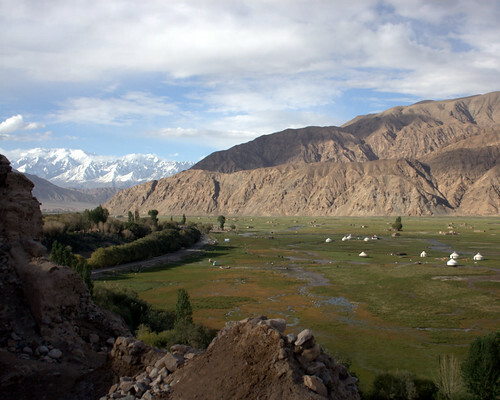 I awoke in Tashkurgan at 15:00, five hours after leaving Kashgar. We lodged at the ubiquitous jiaotong bingguan or “traffic hotel” where we rested for 30 minutes, then got some laghmian for lunch. Arnab and I sat around waiting on the driver for an hour or more (during which I burned through more of Team of Rivals) until he finally came down to the lobby and drove us to a couple of sites. 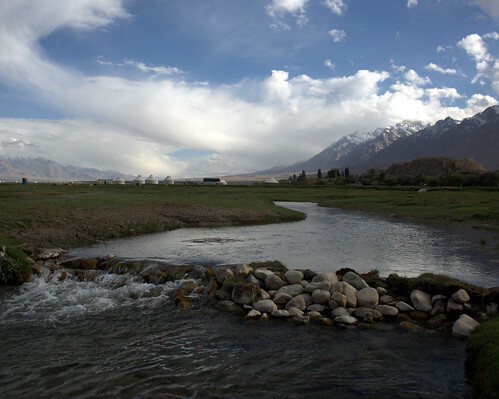 The river delta-meadow at the east end of Tashkurgan is beautiful and idyllic, ringed by massive mountain ranges. This great peace of cool weather, clean(-ish) air and pastoral quiet was totally sullied when a family living in a concrete yurt there, no doubt spurred on by the presence of tourists, switched on the fake ethnic music. It was as loud as a rock concert and echoed off all the mountains – and worst of all, the amplifier was pointed directly at the walkway into and out of the middle of the field, where we were strolling. After we escaped that visual siren’s trap, we climbed up to the ancient fort ruins where I took some more landscape pictures. We then returned to the hotel, ate dinner including Arnab’s precious tudou si, and slept. By the end of the day, we found out that we wold be able to see the Khunjerab Pass, and we agreed to pay 350 RMB extra to the driver for this purpose. 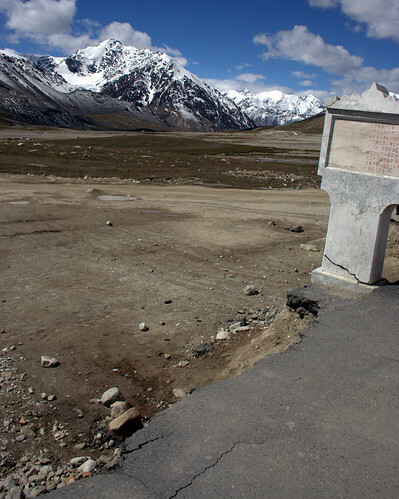 The next morning, the 9th of September, we left for the Khunjerab Pass. 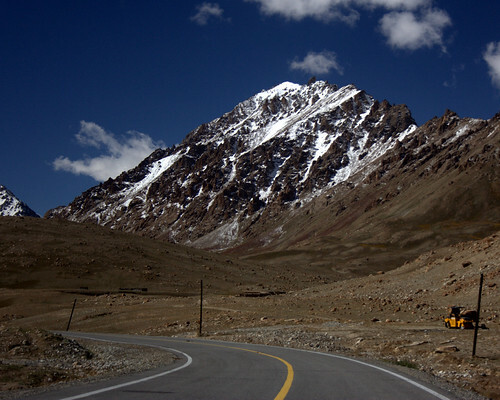 The Karakoram Highway here rolls through amazing, epically beautiful scenery through a long straight valley set on either side by world-class mountain ranges, the Karakoram. 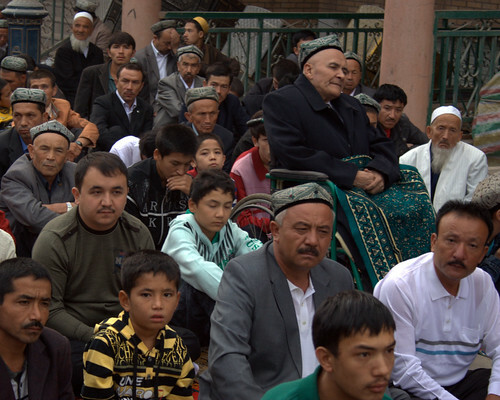 Tajiks abound in this part of China, especially in Tashkurgan and the southern valley. To reach the Pass we had to pay ten kuai and turn in our passports at the customs station just south of Tashkurgan; this earned us a permit to move forward to, but not far beyond, the border. Along the Highway we passed within about 20 km of Tajikistan, 80 km of Afghanistan, and 40 km of Kyrgyzstan. One kilometer before the border with Pakistan, we stopped for what seemed like an hour – it was hard to tell since we were 4600 m up and our heads hurt. When enough tourists queued, the border army police opened the gate, one of the army men sat in our taxi, and we drove up to the border itself at the pass, which is quite wide and long. The Chinese road is paved right up to the line itself, at which point it abruptly ends. The Pakstani side of the Highway is a rough dirt track. We stood in Kashmir, currently controlled by Pakistan, for a bit. I had to wear Arnab’s coat since it was so cold up there and I was not prepared. Some Pakistani border guards came and we shook hands with them. One of them said Arnab “looked Pakistani,” which made him laugh ironically since he’s of Indian ancestry. After maybe ten minutes, we were shooed back into the cars by the Chinese police. Thus, on the fifth anniversary of my joining AIESEC, I visited the highest border crossing in the world and stood astride two worlds. 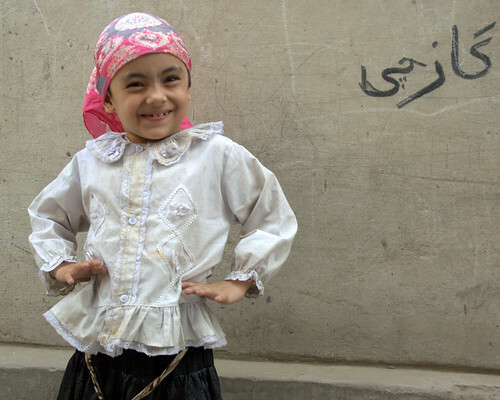 We ate da pan ji in Tashkurgan for lunch and had to pay for the driver’s share. 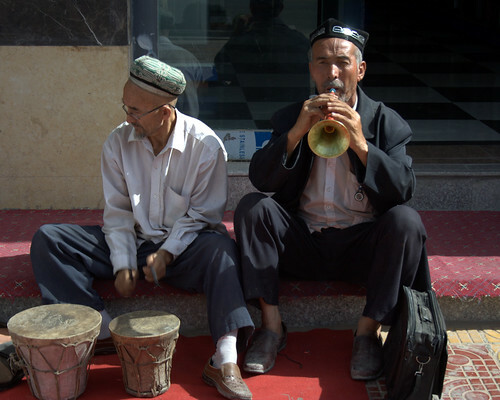 After we got our passports back, we had an uneventful return to Kashgar. Upon our return there commenced an episode in which the Chini Bagh did not honor our reservations, so we got a room at the much more pleasant Home Inn just down the street. 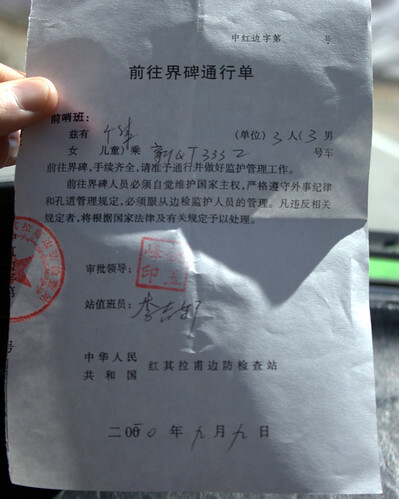 At first the concierge said “no foreigners, you don’t have a permit” so I showed him my visa, when he replied “oh, yes you do.” Do they really believe that foreigners can / do get into the country without the proper paperwork? 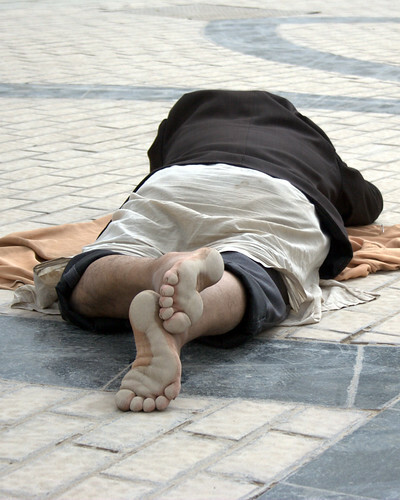 I slept fitfully that night and awoke on Eid ul-Fitr, Friday the tenth. We saw about twenty thousand penitents pray at Id Kah Mosque. I felt disliked by the locals and very out of place. This was right around the time when Obama had announced the “end” of “combat missions” in Iraq, and it was the day before September 11 and when that guy in Florida said he would burn a Koran. It may have been my imagination, but it sounded like the imam said “Obama” a lot during the prayer. This was the first time I had ever seen any kind of Muslim religious ceremony, and I think that Eid ul-Fitr counts as the top example of such an occasion. After the morning ceremony, I relaxed most of the day. At the infamous Fubar, just outside the Chini Bagh, I met a friendly fellow named Brian from San Francisco. We talked for awhile about the Karakoram Highway – he was looking to cycle up to Karakul Lake – and agreed to meet for dinner later that night. Despite it being Eid we had a hard time finding a proper restaurant; the place where we wound up was rather dirty. At Arnab’s insistence we got da pan ji again. 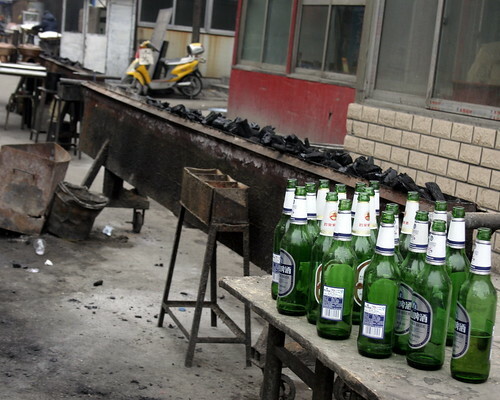 Arnab, not being much of a drinker, retired after this to prepare for our 24-hour train journey to Urumqi the next day. I joined Brian at Fubar for a drink. Before we even reached the bar I started feeling a bit queasy. In the middle of our conversation at Fubar I had to excuse myself to employ the facilities. Post-facilities I felt fine again, so it was clear that the da pan ji was bad, though I was the only one to get ill. The next morning, my final act before departing to the train station was to check my email for any news on DC employment updates. Fortuna had smiled upon me – I was accepted to a three-month internship at the New America Foundation‘s Open Technology Initiative! My search for some form of employment had finally come to an end. I sent a quick positive reply, and we began our grueling nine-day journey from the farthest point in the PRC from Beijing back to the city that had been my home for a year. Thus commenced my final fortnight in China. 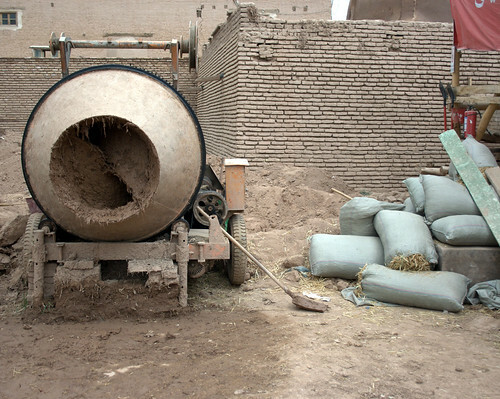 We went to Yarkand because it was on the way to Kashgar and the Lonely Planet described it as a town of the “by-gone Silk Road days.” Though I would not recommend going to Yarkand on an out-of-the-way day trip when you are on a time budget, I was glad we stopped on our way through. 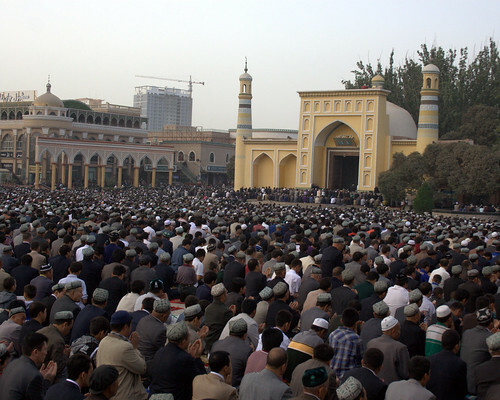 There is the nice Altyn Mosque, an old royal and a common mazar or Islamic graveyard, and a shrine to Ama Isa Khan, a Uighur princess from the 16th Century who collected Uighur poems and music. In this way it reminded me of a sort of Central Asian Rose Hill Cemetery. The price to enter everything was just 15 RMB. The sleepy old town makes for an interesting walk-through. The only negative I can recall was that when we awoke in our hotel, there was a massive dust storm which did not subside until Eid on the 10th, five days later. Thus the old town was covered in dust so I did not bring my camera fearing damage to the sensor, which was a stupid decision. 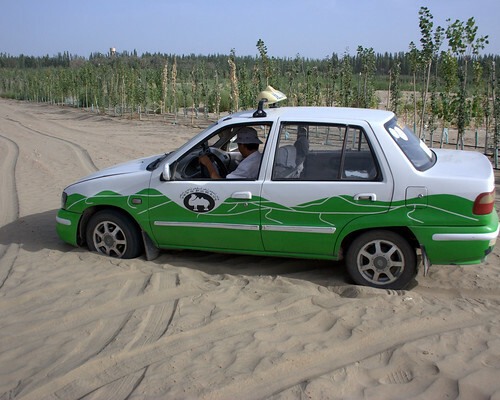 We hired a taxi to Kashgar instead of waiting for a bus, which took a long time in finding a third and fourth person to make the trip worthwhile for the driver. 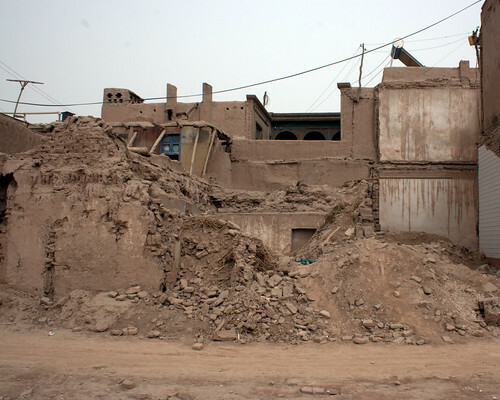 Eventually, after bumping over rough roads partially washed out by rains and rivers, we arrived in Kashgar that evening. On our 24-hour sleeper bus ride across the Middle Silk Road and the Taklamakan Desert, I saw lots of oilfields and derricks and I read hundreds of pages in the amazing Team of Rivals. We drank tea and ate laghmian, or Uighur pulled noodles, at a roadside stop once sundown came at 21:30 Beijing time, 19:30 Xinjiang time (this is done because Xinjiang is so far from Beijing, whose time zone is officially imposed on the entirety of the PRC). I got very fitful sleep thanks to the bad roads and discomfort. 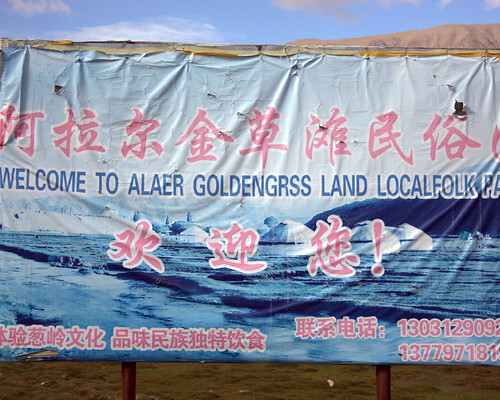 I awoke in the morning while the bus crossed over the Aksu-Hotan Cross-Desert Highway. The Taklamakan Desert seemed like the beach without the ocean: sporadic but plentiful trees and shrubbery on low rolling dunes, a far cry from the massive Arrakis-dunes of Dunhuang. 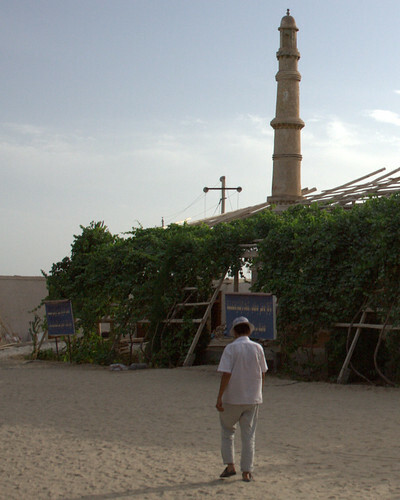 We disembarked in Hotan, a major point on the Southern Silk Road. We forced down a cheap Chinese lunch before trying to get a room at the the Yingbingguan hotel, but they said “no foreigners allowed.” So we went to their other branch, which tried to shoo us away with “we have no rooms, try the Yingbingguan.” I explained that we had already tried to get a room there. After the concierge called the Yingbingguan, she said “Okay, we have rooms.” It frequently happens this way. We took a nap to remedy the poor sleep we fought for on the not-so-sleeper bus. Later that afternoon we visited the Hotan Cultural Museum which despite its poor translations includes two ancient well-preserved Indo-European mummies. 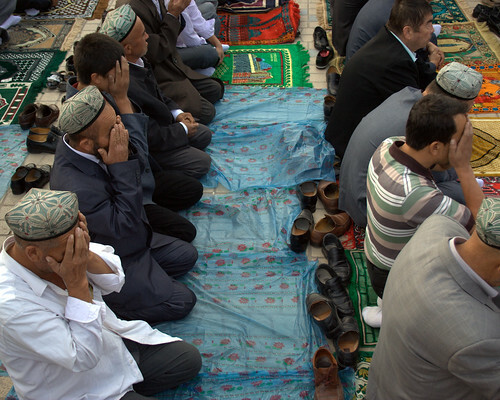 Their shoes were interesting, not unlike the traditional shoes Uighurs wear today. The museum also boasted a spiffy wooden coffin with Buddhist and Chinese-language paintings on it. These were the people and artifacts who made Hotan an important Central Asian trading hub famous for its jade, the most highly prized form of the stone in China. 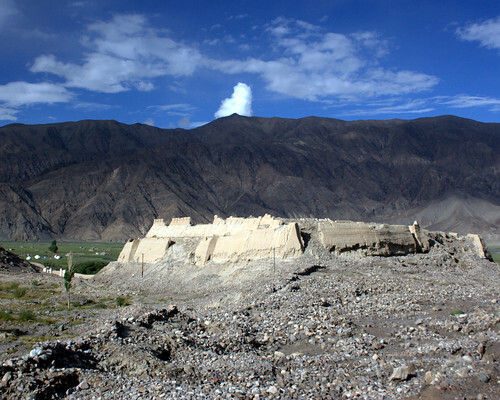 It seems that Chinese demand for reliable access to Hotanese jade spurred the development of what we now know as the Silk Road. That evening, Arnab and I had a misadventure trying to reach the Imam Asim Shrine when our driver went the wrong way down a sandy desert path and got the taxi stuck. It took over 30 minutes to help get him out, and a guy on a motorcycle came by to help. We sandwiched on the back of his whip and tossed about in the thick sand until we reached the blacktop, when we got back in the taxi and the driver took the correct, non-sandy road to the shrine. The mosque had a peaceful, quiet air about it. It is out of the way of the main town drag just inside the desert, and there are Tibetan-Mongolian influences in the burial mounds. That night we ate overpriced local food at the night market and watched some of a cultural performance in the square. The bus to Yarkand did not leave until about nine the next evening, so we had plenty of time to see the Sunday Market. It was fascinating; one can find everything and everyone from around the area comes to see and sell. 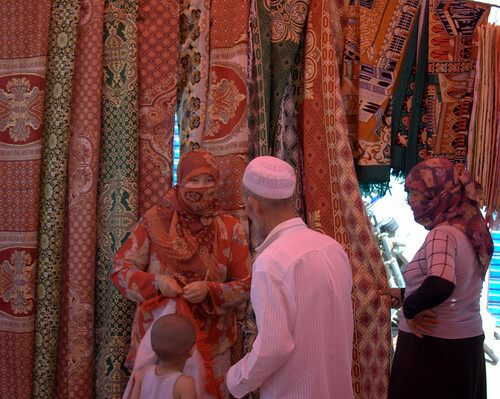 It is much bigger than Kashgar’s Sunday market, and we were the only foreigners there; we only saw two small clutches of Chinese tourists whilst perusing the market. It is held in a vast space which includes packed covered shopping arcades and several long avenues with three rows of goods. The only negative (major for me) is that in Xinjiang for some reason, raw meat and delicious pastries offered outdoors are absolutely swarmed with yellow jackets, and I have a phobia. How the butchers and sweets-sellers sit and butcher and sell these things all day long while surrounded by a cloud of wasps I will never understand. We got lost in the massive market for a couple of hours, and aside from the heat, the escape from the vespid plague most relieved me. We spent the rest of the day eating a long Chinese lunch, the only kind of food readily available in daylight during Ramadan, and I read plenty in Team of Rivals. The bus took six hours to reach Yarkand at 3 AM and was super-uncomfortable, not least because the driver played loud Uighur KTV videos at the front where we sat. 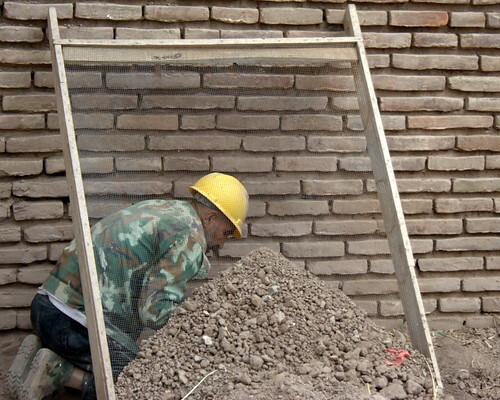 All of my photos from Hotan can be found here.